The 1952 Topps Mickey Mantle baseball card continues to be in more demand than any other player from the post-war vintage era -- and Dean's Cards now has a 1952 Topps Mickey Mantle PSA2 for sale. We don't get to see one of the most popular baseball cards in the hobby very often, so when we do, it's pretty exciting. 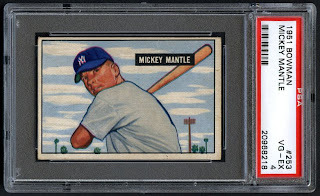 1952 Mickey Mantle PSA 2 now available at Dean's Cards. 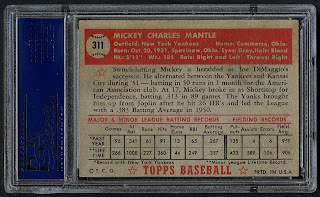 Most people can name the most valuable post-war baseball card as the 1952 Topps #311 Mickey Mantle, but few realize that it was "double printed", which means that the printed sheets contained two Mantle cards and twice as many were printed when compared to normal cards. (The first three cards of the 6th series were double prints.) Can you imagine what the value of Mickey's 1952 card would be if it were not a double print? The back of the famous 1952 Topps Mickey Mantle card from Dean's Cards. The 1952 Topps Baseball Card set was the brainchild of Sy Berger - now known as “the father of modern baseball cards." The card market had been dominated by Bowman since 1948, when Bowman had the insight to sign the players to exclusive contracts to use their images. In 1950, Sy convinced the Shorin Brothers, his bosses and owners of the upstart Brooklyn-based gum company, that Topps could make an impact in the baseball card market. Visit Dean's Cards for the best selction of 1952 Topps baseball cards. The 1952 Topps Baseball Card set was the first mainstream set issued by the Topps Gum Company and far surpassed all earlier sets in size, quality and quantity. The giant sized cards symbolized America’s new postwar prosperity and became an instant hit with collectors and set a new benchmark for the hobby. The upstart Brooklyn based Topps company carefully planned their attack on Bowman’s dominant position in the baseball card market. The 1952 Topps Baseball Cards were the first to be issued in six series. Each series was carefully proportioned with a fairly equal number of stars and players from each team. The 1952 Topps cards were 52% bigger in size than the 1952 Bowman cards and had 61% more cards in the set. The 1952 Topps 6th series was distributed in such low numbers that it is the toughest and most expensive high number series in the history of collecting and the hardest set to complete. For the next decade, Topps tried to give away these cards at various promotions, until they finally gave up and dumped the remaining 1952 Topps cards into New York Harbor! Just think, in 1960 someone could have purchased these cards from Topps for pennies on the dollar. Dean’s Cards continues to offer the best selection of 1952 Topps baseball cards available online, and the cards continue to grow in popularity for collectors. But for the budget collector, the very nice 1952 Topps Reprint set also is available at Dean’s Cards. The 1952 Topps Reprint Baseball Cards are an affordable way to buy a Complete Set or build a Team Set at an affordable price. The 1951 Mickey Mantle Bowman is really his first rookie card-- and it is available here at Dean's Cards. 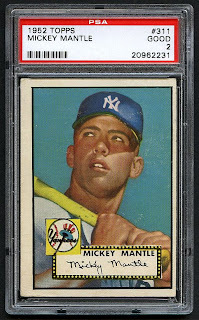 Although the 1951 Bowman Mickey Mantle is his official rookie card, the 1952 Topps Mickey Mantle card remains the most famous. And if you're interested in any Mickey Mantle cards or any other hard-to-find vintage cards, let Dean's Cards do the card hunting for you. For serious Mickey Mantle collectors, please see our growing collection of Mickey Mantle baseball cards and magazines.